Are you just a mom-to-be, or are you a Hot Mom-to-Be? There are so many books out there that take you through all nine months of pregnancy and tell about everything from fetal development to pregnancy symptoms and more. This book not only takes you through the nine months, but it does so with tips, anecdotes, and must-have (and would-LOVE-to have) products. This is not your average pregnancy book! I was hooked on this book from the first page! In each chapter (there are nine - one for each month of pregnancy), there are different sections to help Hot moms-to-be with that month's pressing topics. There are also four special sections in each chapter that highlight special issues. For example, the "Bump on a Budget" sections might include tips on how to save money as well as product ideas that are on the cheaper end of the financial spectrum. The "Eco-Minded Mama" section deals with "green" products and eco-friendly alternatives to commonly used items. "Dads are the New Mom" sections share tips on getting Dad more involved with the baby, and the "$tuff to Drool Over!" sections display higher-end baby items that some moms like to splurge on. The purchasing information is also given for all products mentioned, so there's no need to search! These are some tips on how to break the news that you're expecting to your hubby and family. My personal favorite (creative one) is: "Leave the positive test on the sink and scrawl on the bathroom mirror, Meet me at Babies 'R Us with your wallet and a U-Haul." This is a checklist of different things that you can (and can't) control that can effect the health of your baby. Some examples on the can list are: "Eat healthy," "Take prenatal vitamins," and "Limit caffeine." On the can't control list, we have: "What you did prior to finding out you were pregnant" and "Your mother-in-law." The point is not to stress on the things you just can't control. Here we have some great tips on dealing with morning sickness, as well as a hilarious section about "Olympic Freestyle Vomiting." My favorite tips are "Take more vitamin B6," "Squeeze a little lemon juice on your wrists," and "Get more sleep. You are more likely to feel sick when you are tired." Nearly this entire chapter is devoted to helping you pick out some necessary pieces of baby equipment: strollers, stroller accessories, stuff for Dad, and diaper bags. Chapter 5, pg 180 - 186 - What's in a Name? This section is devoted to helping you pick out the perfect baby name. There are tips on how to deal with other people's baby name suggestions as well as some good ways to make the actual choosing easier. My favorite tip is: "Write down all the names that have meant something to you or your spouse - and then cross out any that produce hives." This is a fantastic way to help ease nausea and "pep up even the most tired of toes." This section deals with several different methods of laboring: Lamaze, Bradley, Hypnobirthing, Belly Dance, Water Birthing, C-Sections, and Doulas. On the page just preceding this guide, there are some incredible birth facts. My favorite fact is: "Jayne Bleackley holds the record for the shortest interval between births - just 208 days - giving brith to a son on September 3, 1999, and a daughter on March 30, 2000." THAT'S CRAZY!!!! 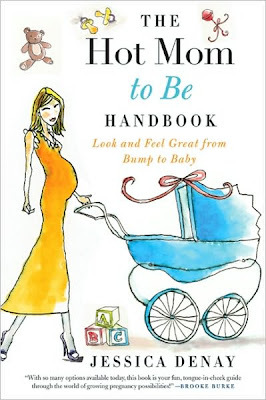 These are just a sampling of the tips and information given throughout this book, and I highly recommend it for any pregnant woman's library. "Jessica Denay is one of the most sought-after celebrity baby shower planners in the industry. The Hot Moms Club has hosted baby showers and coordinated nurseries for Trista Sutter, Alison Sweeney, Brook and Charlie Sheen and Ana Ortiz from Ugly Betty, to name a few. Jessica is the single mom of a nine-year-old boy and the founder of Hot Moms Club, one of the hottest mom groups and websites on the internet. The Hot Moms Club is on the pulse of Hollywood moms trends and celebrity baby products. In addition to contributing monthly to the Mommywood column in Pregnancy magazine, Jessica has appeared on hundreds of television and radio shows, including The Today Show, Tyra Banks, CNN, The Insider, Access Hollywood, and Entertainment Tonight, to name a few. She and the Hot Moms Club have been quoted and featured in dozens of national publications, including the New York Times, USA Today, People, US Weekly, Redbook, In Touch, Life and Style, Woman's Day, Child, and many more. For more information, visit www.hotmomsclub.com or www.jessicadenay.com." A very easy read - keeps your attention and doesn't use "big words"
Bottom line: Go buy this book or have a loved one buy it for you!! This book sounds great!! It's too bad I didn't have this when I was having kids. It sounds so helpful!